Saving For Your Future » Investing » Nutmeg Review – are they the right investment for you? This is an independent Nutmeg* review. I suggest that you read it in full including my analysis of Nutmegs charges and performance. if you wish to jump to a particular part of this review then you can do so via the hyperlinks below. In the interests of transparency, Nutmeg has agreed to pay a small fee for new customers acquired via the asterisked links in this article. However editorial independence is paramount to MoneytotheMasses.com and in no way is this review or my views ever influenced by 3rd parties. I have included a link to Nutmeg at the foot of this article which you can use and MoneytotheMasses.com will not receive any payment from your referral. How do Nutmeg manage their portfolios? Who should consider Nutmeg investments? How does Nutmeg Investment Management work? Nutmeg launched in the UK in 2011 and offers investors a cheaper alternative to normal wealth management services by focussing on ETFs and tracker funds that carry lower charges. Nutmeg offers a Stocks & Shares ISA that can provide a simple low cost method of investing, tailored to your personal risk profile and fully managed by a team of investment professionals. It also offers a Nutmeg pension product* as well as a Nutmeg Lifetime ISA. Nutmeg has also recently launched a personal advice service (see below). How does Nutmeg manage its portfolios? Nutmeg provides a choice of 10 managed portfolios each with a different mix of investment assets. The portfolios range in risk from 'cautious' through to 'aggressive'. Each portfolio is invested in many different types of assets, countries and industry sectors, this diversifies the risk and improves the chances of having money invested in the best places to provide higher returns. Nutmeg regularly reviews the investments in your portfolio to make sure that your money is still invested in the places that best fit your personal investment goals and risk profile. Nutmeg prefers to invest in exchange-traded funds which are designed to track the movement of various market indices. It is a way of getting exposure to a pool of investments without having to purchase each one individually. Also, the costs involved with ETFs are low and they are easy to trade. Nutmeg's fixed allocation portfolios are Nutmeg's attempt to target those investors who want a cheap multi-asset tracker fund portfolio but with minimal additional costs applied for the benefit of having it managed by Nutmeg's investment team. There are 5 set portfolios to choose from ranging in risk level (cautious, steady, balanced, growth, adventurous). As the name suggests the portfolio allocations are fixed and never change. So as markets fluctuate your portfolio will maintain the same exposure to each asset type as it had at outset. To maintain the percentage exposure the portfolio is automatically rebalanced. The fixed asset allocation portfolios are clearly aimed at those investors who want a very low-cost hands-off way of investing in a diversified tracker portfolio. Because the asset allocation is fixed the cost of the service is lower than Nutmeg's managed service as shown in the next section. In November 2018 Nutmeg introduced a new low cost personal financial advice service. Nutmeg will provide an initial one-on-one review which, if you decide to proceed will result in tailored financial advice. The initial chat is free of charge and if you decide to receive further tailored advice and a full recommendation, then Nutmeg will charge £350 plus VAT. Nutmeg's fees depend on the amount of your overall investment as shown below. Nutmeg reduced its fees in early 2017 to those stated below in an attempt to undercut their competition. In addition there are underlying fund charges plus a market spread which covers the trading costs involved in making investments on your behalf. The latest figures can be found on Nutmeg fees page*. The figures in the table above are just Nutmeg's charge for running your money. The chart below shows the performance of each of the 10 Nutmeg managed investment portfolios over the 5 years to 28th February 2019 (the most recent data available at the time of writing) compared against an index of competitors for each of the risk levels. Past performance is not a reliable indicator of future performance. I've colour-coded the rows red where Nutmeg's performance appears to lag its competitors and green where it outperforms. There are a couple of things to point out about the performance figures. Firstly they use an assumption of the average costs incurred by a Nutmeg customer. Also the data which Nutmeg uses as indicative of its competitors is based on data provided by a firm known as Asset Risk Consulting (ARC). ARC take anonymised client return data from wealth managers across the industry and then uses it to benchmark managers such as Nutmeg. You can see from the table above that ARC only has 4 portfolios versus Nutmeg's 10 which makes direct comparison difficult. But the takeaway is that Nutmeg's investment performance is disappointing unless you opt for one of its high-risk profiles. In fact, later in this review I discuss Nutmeg's performance versus their biggest robo-advice competitor, Moneyfarm. You can check the latest performance data on the Nutmeg site*. There is no data available on the new Nutmeg fixed asset allocation models. Nutmeg has a minimum initial investment of £500 (or £100 for a Lifetime ISA). Nutmeg is a suitable investment solution for anybody who wants a low cost way to invest in the stock markets but does not have the time or expertise to make their own investment choices. Also the analysis of their performance data would suggest those willing to take a higher level of investment risk may be particularly suitable. In my view an ideal client would be someone who is happy to take risk, keep their money invested for the long term and who doesn't have the time or expertise to run their investments but realises the importance of controlling costs. Although there are better performing alternatives as explained in the next section. Nutmeg offers a new personal financial advice service that may be attractive to those that are wanting to take advice, but want to do so at low cost. 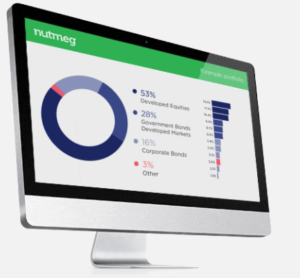 Nutmeg* is the most well-established brand in the UK when it comes to managed tracker portfolios. Since it launched in 2011 it has become one of a growing band of robo-adviser propositions which have come to the market. One such robo-advice proposition, and Nutmeg's biggest competitor, is Moneyfarm which launched in the UK after successfully becoming one the largest digital investment firms in Europe. I compare Moneyfarm's charges and performance against Nutmeg's in my Moneyfarm review. If you look at how much Moneyfarm's portfolio has outperformed Nutmeg's since launch you will be quite shocked. Plus, in my review, I explain how you can get a free get portfolio consultation and a dedicated investment consultant with Moneyfarm. Moneyfarm recently changed its fees to be more in line with Nutmeg but my Moneyfarm review explains how you can get a discount on these charges or receive a £100 bonus when you sign-up for a Moneyfarm pension. Overall I would choose Moneyfarm over Nutmeg, especially if you have a medium risk investing profile. If you would rather pick your investment funds yourself, rather than have someone run it for you, then as an alternative to Nutmeg you could use a fund platform such as Hargreaves Lansdown or Vanguard Investor. Read our full Hargreaves Lansdown review and Vanguard review for more information. The former is the market leader and offers the widest range of funds which can be held in their ISA, Lifetime ISA or Vantage SIPP. While Vanguard provides one of the cheapest ways to build a bespoke portfolio of tracker funds. If you like the idea of picking your own funds using a fund platform like Hargreaves Lansdown but don't know where to start then have a look at our 80-20 Investor service which empowers DIY investors to make their own investment decisions. How safe is a Nutmeg investment? There has been a lot of press coverage over the fact that Nutmeg has yet to make a profit as a company. In fact Nutmeg's lost over £9m in 2016. As with most robo-advice propositions their business model becomes profitable once they hit £1billion to £1.5billion AUM (assets under management). Nutmeg has hit £1billion AUM. So as strange as this may sound some early stage losses are to be anticipated and Nutmeg secured a further £42million in funding from backers at the end of 2016 and another £45million at the start of 2019. In any event, Nutmeg holds clients' investments with a 'custodian bank', this is a specialised financial institution responsible for safeguarding a firm's, or individual's, financial assets. Clients' assets are therefore separate from Nutmeg assets so should not be affected if the company failed in the future. You can find out more information in Nutmeg's FAQs*. Also any investments in Nutmeg are covered by the Financial Services Compensation Scheme which covers investments up to £50,000. What are customers' views regarding Nutmeg's service? If you are looking for a low cost stock market investment service then take a look at Nutmeg. It remains one of the cheapest online investment services especially if you are looking for someone to manage your portfolio and make tactical decisions. It also provides an additional advice service. Overall Nutmeg gives simple easy access to investing within a Stocks and Shares ISA*, Lifetime ISA or a pension* with a track record of providing competitive returns over time. However, Moneyfarm not only has produced better investment returns since launch it is also possible to secure a discount on their annual management fees, get a free portfolio consultation, a dedicated investment consultant and a £100 bonus added to your pension (see my full Moneyfarm review for more information).